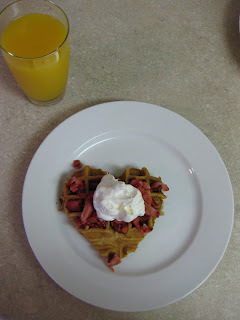 We had a nice valentine's day starting with heart-shaped waffles, topped with strawberries and whipped cream.mmmm. 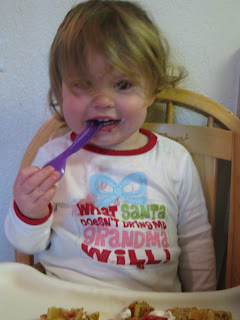 Zoe enjoyed her breakfast treat. 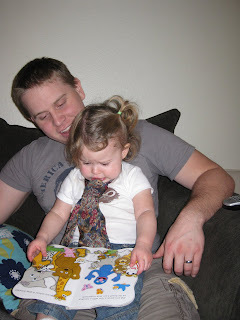 Zoe has been into playing with Ryan's ties lately and wanted to wear one the other night. So Ryan tied it for her, and she wore it until bathtime, it was funny. She kept moving it to the side when it would get into the way. Our sweet niece, Corrine, left this world after 100 hours of life. I'm so grateful for the Plan of Salvation, and knowing that we'll get to meet her sweet spirit one day. We'll be attending her funeral this weekend and saying good-bye. Please keep the Berg family in your thoughts and prayers.